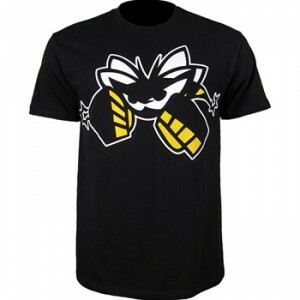 Check out the Anderson Silva UFC 126 Walkout T-Shirt. Anderson Silva is the current UFC Middleweight Champion and is the longest reigning champion in the UFC. Receiving mixed opinions from fans and fighters alike because of his personality, one thing is for certain: Silva’s fighting prowess has been proven time and time again. He’s faced and triumphed over many challenges, recently against Vitor Belfort at UFC 126 via knockout due to a front kick to the face. An amazing victory indeed. The Anderson Silva UFC 126 Walkout T-Shirt features a spider design, representing Silva’s agility and strength. The Anderson Silva UFC 126 Walkout T-Shirt is available at MMAWarehouse for $27.99.